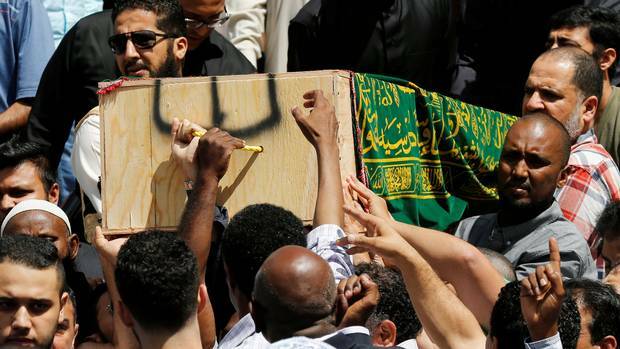 The casket of Abdirahman Abdi, a mentally ill black man who died following his arrest by police, is carried from the Ottawa Mosque after his funeral in Ottawa, Ontario, Canada, July 29 2016. The children are writing his name in chalk. They are gathered outside a tall brick apartment building in Hintonburg, a gentrifying area west of downtown Ottawa, in a subsidized housing complex attached to an immigrant services organization and down the street from a shop selling gourmet doughnuts for $3 a pop. As they skip on the sidewalk, it looks as though they are playing. But they are writing a dead man’s name. And on the ground by the front door where Abdirahman Abdi lay motionless after what many describe as a violent encounter with police, still stained with faint patches of his blood, is another message: Black Lives Matter. Mr. Abdi’s death this week from “medical distress” after what the Special Investigations Unit, a civilian agency that investigates serious incidents involving the police, calls a “confrontation” with officers has added another chapter to an ongoing and contentious debate about how authorities in the United States and Canada treat people of colour. “You can’t help thinking if the guy was white, it wouldn’t have happened like that,” Charles Anderson, who lives nearby, said at a candlelight vigil this week outside Mr. Abdi’s apartment building as Muslim residents performed their evening prayer. A further complication in the case of Mr. Abdi, 37, a Somali man who came to Ottawa with his family from Ethiopia in 2009, is the belief that he suffered from an unspecified mental illness. “We are still grieving,” one of Mr. Abdi’s five brothers, Abdiaziz, said this week as he opened the door for mourners visiting his family, who all live in the same complex. Mr. Abdi’s funeral was held at an Ottawa mosque on Friday. Mr. Abdi was known around his neighbourhood as a quiet but friendly presence who was often seen walking the streets, although some noticed a change in his behaviour in recent months. He was not perceived as a troublemaker, but last Sunday morning police were called to a coffee shop to investigate a disturbance, which allegedly involved Mr. Abdi groping women. Several 911 calls were placed. Mr. Skof said Mr. Abdi was “assaultive” toward police. “Regardless of mental illness, when somebody’s assaultive, they are posing a risk,” he said. Mr. Abdi then took off for his apartment, not far from the shop. Witnesses say that when he arrived home, he was hit by two police officers, who used batons and pepper spray as he tried to get inside his building. “When Abdi stop and he tried to open the door, he immediately – he beat him,” said Zainab Abdallah, who lives in the same building and said she witnessed the incident from the street. “It was the most gruesome thing I ever saw in my life. And everyone needs to remember that. He was a human being,” he said. Videos from witnesses, many of whom watched from their balconies, show a man in a bloodstained blue shirt, handcuffed from behind, lying motionless on the ground as police crouch around him. However, no video of an alleged beating has been seen publicly. Nimao Ali, a family friend, said doctors told the family that Mr. Abdi died 45 minutes before he arrived in their care. But his death was not announced publicly until Monday afternoon. “Whenever an unarmed individual comes into contact with police and ends up dead a very short time later, we have to ask serious questions,” Ontario Ombudsman Paul Dubé said in an interview. In June, Mr. Dubé released a report about the need to overhaul police training in Ontario to better focus on “de-escalation” techniques when dealing with people in crisis. Community Safety and Correctional Services Minister David Orazietti has accepted the report’s 22 recommendations. The SIU’s investigation could take several months to complete. Until then, those who knew Mr. Abdi are left to wonder if there was anything they could have done. Vicky Durand, a receptionist at a nearby services centre, said that in recent months Mr. Abdi would drop by up to 10 times a day, asking to speak to a counsellor – although he never had an appointment. But she said the centre recently informed Mr. Abdi’s family about the frequent visits, and a few weeks ago he stopped coming in. She said she will remember him as a “teddy bear” who just wanted help. “He would put his hands like this, looking at me,” Ms. Durand said, grasping her hands in front of her chest in a prayer. is often used to prevent comments by the Globe's extreme feminist sensors. There is little point in commenting on the Globe's site on any controversial issue as their Feminist Censors remove any post they don't agree with which has spurred a lot of comments on their stories on other sites, simply because the Globe does not like any comment it does not pre-approve of. What's worse is the Globe's use of "spy features" that take a note of your computer's dna, a virtual fingerprint combination of your IP address, your browser and other information that can identify posters it does not like. That information is similar tracked by the other Canadian media which means any sane Canadian citizen will not comment on items in the press under their own name.